gateway to two other islands where the adventurous vibe still flourishes -- Ko Tao, a scuba haven, and Ko Pha Ngan, probably the most ruggedly bohemian of all the Thai islands -- tranquil at times, raucous at others (including the beach front Full Moon parties). Nearby on the mainland, get in touch with terra firma at the oldest evergreen forest on the planet at Khao Sok National Park in the Surat Thani province. If you're lucky you'll see wild elephants, tigers, and bears (oh my!). A bit more touristy of the islands, but still nice island to visit. I believe you have to leave for the other islands from this island. Beautiful little island a short plane ride from Bangkok. After the hustle and bustle of the big city this was a welcome change. When you arrive at the airport you can already tell that most of your time here will be spent just letting your hair down. The airport reminded me of Fantasy Island, "De plane de plane!" I stayed in a hut that was dirt cheap and was about 20 yards from the ocean. The beaches are beautiful but I recommend renting a moped and riding around the island to see all Ko Samui has to offer. Also at night the center of the big town becomes a huge dance party. This a beautiful island in the Gulf of Thailand. It has impressive white sand beaches, wonderful blue water and lush vegetation. It is small enough to be able to get around in a couple of hours and has some nice sights such as the Big Buddha and Fisherman's Village. Having heard about this island for several years it was a lifelong goal to visit Koh Samui. Happily, the Island did not disappoint. From the moment we boarded Bangkok Airways in Bangkok en route to USM (Samui Airport code), our lovely flight, the sweet airport, the quaint and windy roads and the friendly helpful local people, the entire experience has been "next level." While those looking for "undiscovered" locations will be dismissive, I like a balance of people, places and culture and so Koh Samui has a great blend of these activities. Its not too busy, but not too boring. Even Chewang beach, the main strip of commerce and backpackers, wasn't all that gaudy. Luckily, we did stay on the quieter side of the island and only stopped at Chewang to visit a shop for some custom tailoring. The weather while hot and humid is made pleasant by the gentle sea winds and ever-present cold towels infused with flower scents. Note to avid Golfers - there is only one course on the island and its relatively run down. Alternatively, there are a few outlets offering football (soccer) and frisbee golf. Those options seemed fun but we didnt have enough time to try them out on this trip. Can't wait to return again. It's been spoiled a little and needs some love but great local restaurants on the beach all over the island. Beautiful island, worth taking a tour around. Check-out the waterfalls and the giant golden Buddha. A good decompression stop after the full moon party. Ko Samui has a lot of tourists and a lot of fast food, and a bit of a reputation for being... not off the path. I guess what I like about it is the unabashed fun. 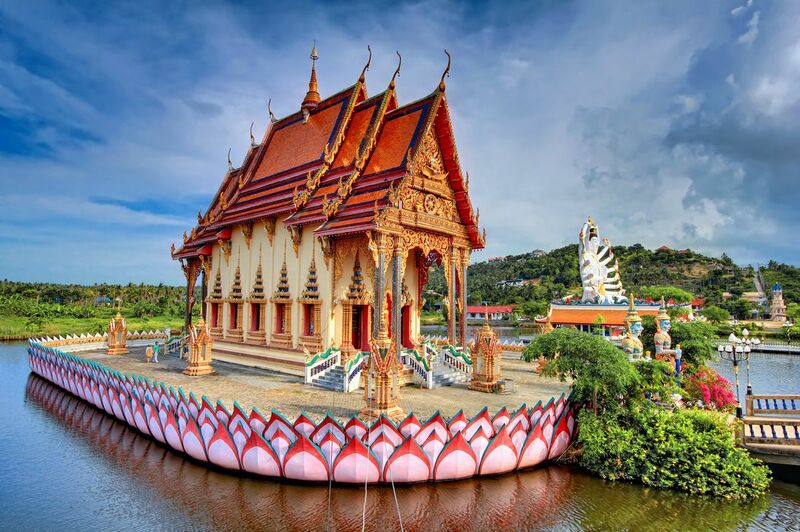 There are more exotic places in Thailand, but, few combine hedonism and natural beauty so well. It also has one of the most beautiful airports in the world.